Paris is a city on Earth. It is the capital and largest city of France. In the Mario franchise, Paris debuted in The Adventures of Super Mario Bros. 3, originally being referenced in the episode "Reptiles in the Rose Garden", and later also appearing in two episodes. In its latest Mario appearance to date, Paris is also one of the locations visited by Luigi in Mario is Missing!. In almost each of the city's appearances, Paris is invaded by Bowser and his Koopa Troop who vandalize several landmarks. Mario and Luigi usually have to rectify the damages. Also, in both The Adventures of Super Mario Bros. 3 and the Mario is Missing! appearances, the Eiffel Tower as one of the city's most famous landmarks appears. 1.1.1 "Reptiles in the Rose Garden"
1.1.2 "7 Continents for 7 Koopas"
2.1 Information from Mario is Missing! "Reptiles in the Rose Garden"
Paris is first mentioned in The Adventures of Super Mario Bros. 3 episode "Reptiles in the Rose Garden". Luigi mentions that Bowser is planning on attacking several Real World cities, including Paris, with the Doomship. Fortunately, Mario and Luigi thwart Bowser's plan before he can even leave. 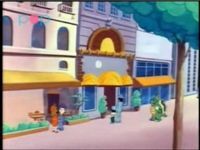 The city is later seen briefly in the episode "7 Continents for 7 Koopas". Bowser orders his children to each take over one of the Real World's seven continents, and assigns Kootie Pie Koopa to take over Europe. Kootie Pie then travels to the Louvre museum, where she uses her magic wand to transform all the paintings into paintings of herself. Mario eventually shows up to defeat Kootie Pie, and restores the paintings to their proper forms. 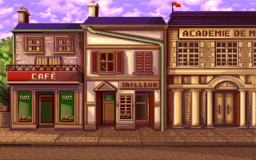 A street in Paris, as seen in The Adventures of Super Mario Bros. 3 episode "Super Koopa." Paris is then featured in the episode "Super Koopa", with most of the episode taking place there. Kooky von Koopa creates a Power Pendant for Bowser, which can grant him the Mario Bros.' Power-Ups. However, the pendant only works in the Real World, so Bowser kidnaps Luigi and takes him through a Warp Pipe leading to Paris. In Paris, Bowser is able to use the pendant to become Raccoon Koopa, allowing him to fly. He quickly ties up Princess Toadstool, tying her to the Eiffel Tower. Bowser then turns into Frog Bowser, in order to pursue Mario, Luigi and the captain of a submarine and capture them. He then throws them in the Bastille and tells some of his kids to come to Paris and run amok. Kootie Pie tries on many bizarre dresses at a clothing store, while Hip Koopa and Hop Koopa replace paintings at the Louvre with their own "masterpieces". Princess Toadstool manages to slip a message to Toad through the Warp Zone connecting the Mushroom Kingdom to Paris, telling him to bring lots of Power-Ups to Paris in order for Mario and Luigi to fight Super Koopa. Toad then sneaks a cake into the Bastille that contains a Super Leaf in a Brick Block, allowing Mario to become Raccoon Mario and escape from prison by tail-whipping the wall. When a Sledge Bro informs Bowser about what happened, he becomes Raccoon Koopa to deal with Raccoon Mario and Raccoon Luigi. While he is distracted, Toad rescues Princess Toadstool from the Eiffel Tower. After some more fighting, Mario and Luigi manage to defeat Bowser by overloading the Power Pendant, sending the Koopa King back through the Warp Zone, where his kids follow. Mario then comments that Paris would not be seeing the Koopas ever again, and that they could not have saved the city without Toad's help. Paris appears in Mario is Missing! as one of the cities Luigi needs to visit in order to defeat the second boss of the game, Iggy Koopa. The city has been invaded by Koopa Troopas who have stolen artifacts from various landmarks: the Cathedral of Notre Dame, the Arc de Triomphe, the Eiffel Tower, and in the PC version, the Louvre. Paris appears exclusively in the PC release of Mario's Time Machine, as one of the locations that Mario visits as he travels back in time to return the items stolen by Bowser. Specifically, he travels to Paris circa 1885, as he needs to return the Flask that Bowser stole from Louis Pasteur just as he was about to create the rabies vaccine. Mario talks to some of the city's inhabitants, including a tailor, a waiter at a café, and Pierre Paul Emile Roux (Louis Pasteur's colleague), about the owner of the flask, and he eventually gets pointed to his lab. He visits Louis, returns the Flask, and time travels away. "The biggest fact I know about it is that it's the biggest country in Europe now that the Soviet Union broke up." "My mom said we could have swam here from England across the Channel, but I forgot my swimsuit." "France is famous for good food and fashion passion." "We landed at L'Airport d'Orly. You remembered your beret, oui?" "Frankly, it takes a lot of francs to see Paris, but you can get French fries pretty cheap." "The Seine is a river, cheri, and winds through 13 kilometers of gay Paris." "Now a Republic since the French Revolution. Parisians knew it was a good solution." "It's sandwiched between Spain and Germany and they used French bread." "You're on 107 square kilometers of French soil in the center of Paris." "Look down, The Champs Elysees is like bicycle wheels, 12 avenues spread out right under your heels." A street in Paris in Mario is Missing! The map of Paris in Mario is Missing! The city below N64 Rainbow Road from Mario Kart 8 resembles Paris. This page was last edited on December 13, 2018, at 13:20.